The Rule of Saint Benedict was one of the quintessential texts of the Middle Ages. It explicitly lays out how to effectively run and be a part of the ideal monastic community – at least in Benedict’s view (there were many other types of monasteries, with their own separate rules). Benedict conscientiously records everything about everything, from eating and sleeping, to clothes, to the order of songs and prayers for services day and night. While the overwhelming focus of The Rule is on order and humble obedience so that everyone has a chance to attain perfection, there are a few rules which modern readers may find particularly interesting (I’m using Bruce L. Venarde’s translation here). 1. Age ain’t nothin’ but a number. For Benedict, age is not nearly as important as wisdom or time spent in the monastic community. Throughout The Rule, he admonishes more senior monks to respect and care for their juniors, and he explicitly points out that “On no occasion whatsoever should age decide or predetermine rank, because Samuel and Daniel judged their elders as boys.” In fact, he also insists that junior monks be included in important decisions “because often the Lord reveals what is best to a junior brother.” “Junior” is a rank that could easily mean a more recently-joined monk, not necessarily a younger man, but Benedict insists that monks who are over fifteen should be accepted as full members of the community, and respected accordingly. 2. Novices were required to sign their lives away. He should make a petition concerning this promise of his …. He should write it with his own hand, or, if he is unlettered, someone he asks should write it and the novice make his mark and place it on the altar with his own hand. 3. Monastic crafts were great for bargain hunters. As with many medieval Christian texts, The Rule has a very firm focus on humility. The section on artisan monks (Chapter 57) explicitly says that an artistic monk who becomes too prideful of his talent must “be banned from doing his craft” until he has regained humility. The artist who is sufficiently humble, however, may have his work sold outside the monastery, although he must be sure that “the wickedness of greed should not creep into [his] pricing.” Benedict says that in order to not be too prideful, “goods should always be sold for a little less than can be done by others who are laypeople, ‘so God may be glorified in all things’.” The handy upside of this is that it made monastic goods competitive, meaning that the monks could avoid being prideful while still generating business. 4. Strangers had to earn their kisses. The Rule of Saint Benedict insists that travelers and strangers be welcomed as guests to the monastery “with every service of charity.” Monks are to meet them “with bowed head or the whole body prostrate on the ground” as they would Christ, himself. Guests’ hands and feet are to be washed by the abbot, and they are to have a place at the abbot’s table at meal times. But, strangely, guests are still to be regarded with some suspicion – at first. When guests arrive and are greeted by the monks, Benedict says, “first they should pray together and thus be united in peace.” But, he adds mysteriously, “This kiss of peace should not be offered until the prayer is finished, because of diabolical trickery.” While Benedict is very forthcoming in other sections of The Rule, he does not spell out what diabolical trickery monks should be guarding against. Perhaps, for a community with no real protection against violence within their walls, this communal prayer served as a sort of guarantee that their guests meant no harm. if he even vaguely senses anger or distress, however minor, of any senior brother’s soul toward him, he should at once, without delay, lie prostrate on the ground at his feet, making satisfaction until the disturbance is healed with a blessing. (This reminds me of Maria von Trapp kissing the floor when she sees Sister Berthe coming, “just to save time”.) 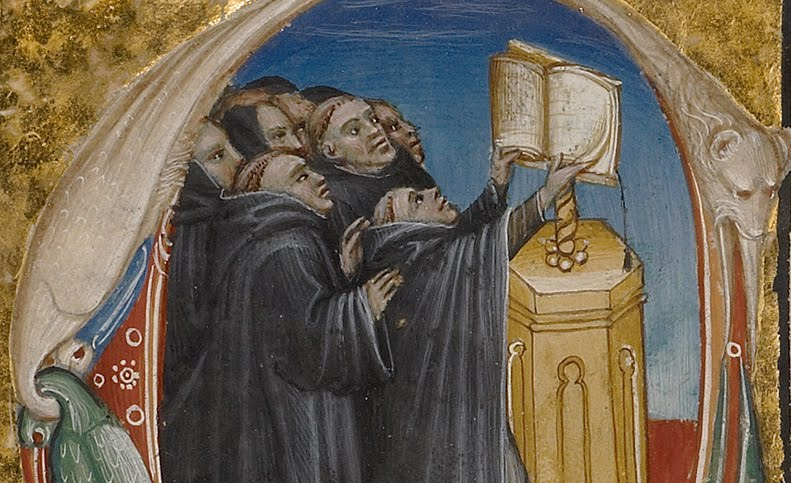 It seems to me that there might be a lot of prostrate monks at Matins if medieval morning faces were anything like modern ones. The Rule of Saint Benedict provides a fascinating view into a large and influential section of medieval society through its theological viewpoint and consideration of daily practicalities. As such, it is definitely a worthwhile read for anyone interested in medieval life, monastic or otherwise. I highly recommend Bruce L. Venarde’s translation for anyone new to The Rule, or for medievalists who love classy-looking editions.